Our field support services team can help troubleshoot issues fast while controlling expensive downtime. 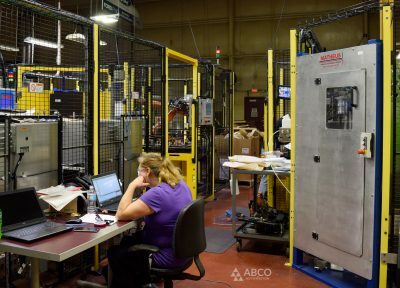 Whether equipment is not performing properly, operating erratically, or has broken down unexpectedly, ABCO has a team to help resolve any issue. When trying to repair a system and it is apparent that additional support is needed, ABCO field technicians can travel to virtually any facility for assisting with a repair. If the requirements are parts related, we can repair or replace parts quickly to avoid as much downtime as possible. ABCO has installed well over 1,000 systems worldwide. Our multinational client base depends on the ABCO support team regardless of the geography. Our service team includes mechanical technicians, electricians, controls engineers, mechanical engineers, mechanical designers, and project managers. We offer training services to assist operators, maintenance personnel, and others in learning to use, maintain, and repair ABCO systems. Our teams can train operators how to maximize productivity from their new systems and tools as well as help keep them in touch with technology changes, safety, and compliance regulations. We provide our clients with repair or replace options which enables them to make the best financial choice for their situation. ABCO technicians cross-check every repair against safety and compliance standards. In cases where the technology is outdated, we can recommend an updated solution. Often times, we find that it costs less to replace a part rather than repair it. We can help determine the best solution by evaluating all factors involved in the situation. When a client simply can't wait for an expert to arrive on site, ABCO may be able to help get operations up and running over the phone. Every ABCO system can be configured for remote support capabilities, allowing our technicians to access a system, monitor event logs, and diagnose issues. Service team members can train operators how to get the most out of the new system. ABCO field support can troubleshoot issues fast while controlling expensive downtime.